Having devoted extensive attention to the development of philosophy among the ancient Greeks, we’ll now cover more than a millenium of Western thought more briefly. The very name “medieval” (literally, “the in-between time”) philosophy suggests the tendency of modern thinkers to skip rather directly from Aristotle to the Renaissance. What seemed to justify that attitude was the tendency of philosophers during this period to seek orthodoxy as well as truth. 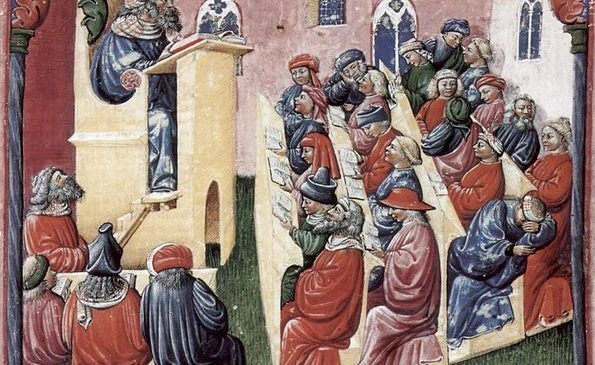 Nearly all of the medieval thinkers—Jewish, Christian, and Muslim—were pre-occupied with some version of the attempt to synthesis philosophy with religion. Early on, the neoplatonism philosophy of Plotinus seemed to provide the most convenient intellectual support for religious doctrine. But later in the medieval era, thanks especially to the work of the Arabic-language thinkers,Aristotle’s metaphysics gained a wider acceptance. In every case, the goal was to provide a respectable philosophical foundation for theological positions. In the process, much of that foundation was effectively absorbed into the theology itself, so that much of what we now regard as Christian doctrine has its origins in Greek philosophy more than in the Biblical tradition. The first truly great medieval philosopher was Augustine of Hippo, a North African rhetorician and devotee of Manichaeanism who converted to Christianity under the influence of Ambrose and devoted his career to the exposition of a philosophical system that employedneoplatonic elements in support of Christian orthodoxy. 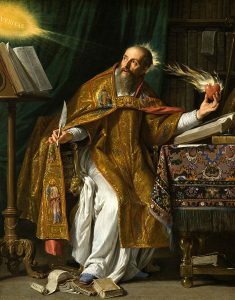 The keynote of Augustine’s method is “Credo ut intellegiam” (“I believe in order that I may understand”), the notion that human reason in general and philosophy in particular are useful only to those who already have faith. Thus, for example, Augustine simply rejected the epistemological criticisms mounted by the Academic skeptics. Even if it were true that I am mistaken about nearly everything that I suppose to be true, he argued, one inescapable truth will remain: “Si fallor, sum” (“If I am mistaken, I exist”). [This doctrine is an interesting anticipation of Descartes’s later attempt to establish knowledge on the phrase “Cogito ergo sum”.] Upon this foundation, Augustine believed it possible to employ human faculties of sense and reason effectively in the pursuit of substantive knowledge of the world. Although Augustine was significantly influenced by the moral philosophy of Cicero, he generally argued that the Stoics were excessively optimistic in their assessment of human nature. One of Augustine’s central contributions to the development of Christian theology was his heavy emphasis on the reality of human evil. Each one of us, he believed, is sinful by nature, and the account of his own life provided in the early portions of the Confessions makes it clear that he did not suppose himself to be an exception. If, as Augustine certainly believed, the world and everything in it is the creation of a perfectly good god, then how can the human beings who constitute so prominent a part of that creation be inherently evil? Like Platoand Plotinus, but unlike the Manichaeans, Augustine now argued that evil is not anything real, but rather is merely the absence of good. Creation of human beings who have the freedom to decide how to act on their own, he maintained, is so vital a part of the divine plan for the cosmos that it outweighs the obvious consequence that we nearly always choose badly. This emphasis on the infinite power of god’s will raises a significant question about our own capacity to will and to act freely. If, as Augustine supposed, god has infinite power and knowledge of every sort, then god can cause me to act in particular ways simply by willing that I do so, and in every case god knows in advance in what way I will act, long before I even contemplate doing so. From this, it would seem naturally to follow that I have no will of my own, cannot act of my own volition, and therefore should not be held morally responsible for what I do. Surely marionettes are not to be held accountable for the deeds they perform with so many strings attached. Augustine’s answer to this predicament lies in his analysis of time. A god who is eternal must stand wholly outside the realm of time as we know it, and since god is infinitely more real than we are, it follows that time itself does not exist at the level of the infinitely real. The passage of time, the directionality of knowledge, and all temporal relations are therefore nothing more than features of our limited minds. And it is within these limitations, Augustine supposed, that we feel free, act on our volitions, and are responsible for what we do. God’s foreknowledge, grounded outside the temporal order, has no bearing on the temporal nature of our moral responsibility. Once again, a true understanding of the divine plan behind creation resolves every apparent conflict. European culture developed only very slowly after the collapse of the Roman Empire in 427. Theological controversies and narrow-minded defenses of traditional doctrine and practice were the sole pre-occupations of educated clergy. During these “Dark Ages,” concern with the necessities of life and anti-intellectual sentiment in the church did little to encourage philosophical speculation. Although many nameless individuals worked to preserve the written tradition of what had gone before, there were few genuine high points in our philosophical history for a few hundred years. An anonymous Christian writer of the fifth or sixth century (later designated as the pseudo-Dionysius) distinguished between two distinct approaches that human beings might take in their efforts to understand god. The via positiva is the method of reasoning analogically from the perceived nature of existing objects through successive layers of causal emanations until we arrive at some conception of the divine essence from which all flows. The via negativa, on the other hand, denies the literal truth of any comparison between natural things and god and relies instead upon mystical consciousness as the only possible source of genuine knowledge. Thus, in good neoplatonic fashion, god’s unity and goodness are contrasted with the degenerate plurality and evil of the created order. As classical scholarship began to wane, preservation of the philosophical tradition required capable translation of the central works from Greek into Latin. This labor was the great contribution of Boethius, whose translation of Aristotle’s logical works provided the standard set of Latin terms for the logic of the middle ages. Moreover, Boethius’s Commentary on the Isagoge ofPorphyry focussed medieval attention on a metaphysical problem that arises from the simple fact that two or more things may share a common feature. The President of the United States and my youngest child, for example, have something in common, since they are both human beings. The problem of universals asks the metaphysical question of what in reality accounts for this similarity between distinct individual substances. When we predicate of each substance the name of the species to which they both belong, what kinds of entities are truly involved? 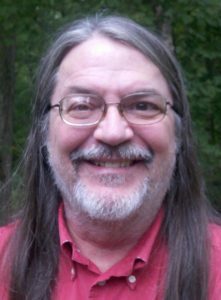 If the species itself is a third independently existing entity, then we must postulate the existence of a separate sphere of abstract beings like the Platonic forms. If, on the other hand, what is shared by both substances is nothing more than the name of the species, then our account of resemblances seems grounded on little more than linguistic whim. The difficulty of providing a satisfactory account of the predication of shared features provoked intense debate throughout the middle ages. As we’ll soon see, the variety of positions adopted with respect to this metaphysical issue often served as a litmus test of academic loyalties. Thus, Erigena completes the logically tidy picture with a fourth category of existence that contradicts yet must be identified with the first, emphasizing the view that only mystical consciousness can even try to grasp the nature of god. Each human being is a microcosm in whom analogues of these four fundamental elements combine to produce a dynamic whole whose existence and activity mirror those of the universe.Few of Erigena’s contemporaries appreciated the subtlety and logic of this view, however. Subordinating dialectical reasoning to the presumed dictates of revealed religion at every opportunity, many medieval writers defended and even encouraged the kind of deliberate ignorance that results from an unwillingness to question prevailing opinion. The Socratic spirit nearly disappeared. 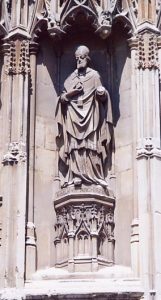 The end of the “Dark Ages” in the philosophical tradition is clearly marked by the work of Anselm of Canterbury. 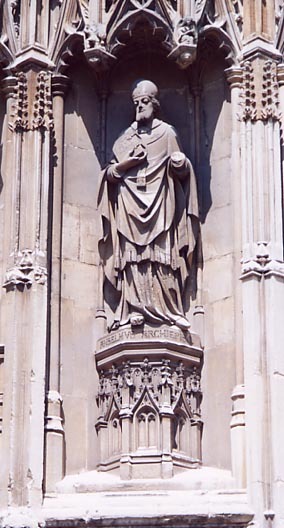 Explicitly rejecting the anti-intellectual spirit of preceding centuries, Anselm devoted great care to his cultivation of the Augustinian theology of “faith seeking understanding.” In the process, Anselm initiated an entirely new way of demonstrating the existence of god. Reflecting on the text of Psalm 14 (“Fools say in their hearts, ‘There is no god. '”) in his Proslogion, Anselm proposed a proof of divine reality that has come to be known as the Ontological Argument. The argument takes the Psalmist quite literally by supposing that in virtue of the content of the concept of god there is a contradiction involved in the denial of god’s existence. Anselm supposes that in order to affirm or deny anything about god, we must first form in our minds the appropriate concept, namely the concept of “that than which nothing greater can be conceived” (in Latin, “aliquid quod maius non cogitari potest”). Having done so, we have in mind the idea of god. But of course nothing about reality usually follows from what we have in mind, since we often think about things that do not (or even cannot) actually exist. In the case of this special concept, however, Anselm argued that what we can think of must in fact exist independently of our thinking of it. Something certainly seems fishy about this argument. It is extraordinary to suppose that merely thinking about something makes it so. But it turns out to be difficult to specify precisely what the problem is with Anselm’s reasoning here. Early objections (like those of the monk Gaunilo) focussed on the notion of conceivability at work here, proposing a similarly absurd argument for the reality of the most perfect conceivable island. But Anselm’s claim is that only the concept of god unites all of the perfections under the umbrella of absolute unsurpassibility. What is more, Anselm supposed that existence is an essential feature of god’s nature, and many philosophers have pointed out that existenceis not a feature that could properly be included in the essence of any object. But the restatement of the argument in Proslogion 3 seems to suggest that it is necessary, not merely contingent, existence that must be predicated of the deity, and this version may avoid the conceivability issue altogether. Perhaps the real difficulty with this argument has less to do with conceivability than with the idea of perfection in general, with its attendant notion of unsurpassability. “The person taller than whom no other person is now living” must truly exist in reality as well as in our minds (provided that there is at least one living person), but it is not clear that “the person taller than whom no other person can ever live” exists as a coherent concept even in the understanding, much less in reality. In similar fashion, it may be that there is no concept corresponding to the words, “that than which nothing greater can be conceived,” giving the ontological argument no foundation. Despite all of these difficulties, Anselm’s effort has continued to find sympathetic supporters for nearly a millenium. Remember that within the Augustinian approach, the demonstration is not really intended as a proof that will persuade unbelievers to convert. Rather, it occurs within the context of prayerful meditation, as one element in the believer’s ongoing pursuit of faith seeking understanding. Anselm’s patient and rational approach to philosophical issues and his willingness to engage in debate with other thinkers who disagreed with the positions he defended were greatly influential on western culture. They helped give rise to the development of scholasticism, a process of intergenerational cooperation engendered by shared appeal to a common tradition of rational argumentation. One of the issues that most plagued scholastic philosophers during this period was the problem of universals. What is the ontological status of the species to which many things commonly belong? Realists, following in the tradition of Plato, maintained that each universal is an entity in its own right, existing independently of the individual things that happen to participate in it.Nominalists, on the other hand, pursuing a view nearer that of Aristotle, held that only particular things exist, since the universal is nothing more than a name that applies to certain individual substances. The difficulties with each position are clear. Nominalism seems to suggest that whether or not two things share a feature depends solely upon our accidental decision whether or not to call them by the same name. Realism, on the other hand, introduces a whole range of special abstract entities for the simple purpose of accounting for similarities that particular things exhibit. In the medieval spirit of disputation, each side found it easier to attack its opponents’ views than to defend its own. But the most brilliant disputant of the twelfth century invented a third alternative that avoided the difficulties of both extremes. In the centuries during which scholastic philosophy emerged among the Christians, Muslim thinkers in the Arab world that spanned Persia, North Africa, and Iberia dealt with many of the same issues. Like their European counterparts, Arabs tried to work out an appropriate synthesis of philosophy with theology, struggling as the Christians had with the relationship between faith and reason and the effort to provide an account of human nature that left room for the hope of immortality. But since their culture had preserved both the ancient texts and classical learning to a greater degree, the Arab thinkers had access to a wealth of material from the Hellenistic world of which the Latin philosophers of the dark ages were ignorant. Thus, for example, the neoplatonic philosophy of the first great Arab thinker,al-Kindi set the tone for many generations of Islamic synthesizers. His near-contemporary al-Farabi not only made use of the logical treatises of Aristotle(which even the Christians knew) but also employed arguments for the existence of god based upon those in the later books of Aristotle’s Metaphysicsas well. Designed to provide a rational foundation for orthodox monotheism, many of these arguments would make their way into the Christian tradition only in the thirteenth century. Not everyone appreciated such applications of the philosophical tradition, however. Several generations later, al-Ghazali wrote a lengthy treatise called Tahafut al-Falasifah (The Incoherence of Philosophers), in which he used logical methods derived from the philosophical tradition to generate puzzles and contradictions, thereby undermining confidence in the power of human reason and encouraging reliance on an unreasoned faith instead. Even in the more scientific culture of the Muslim world, philosophical speculation remained suspect for centuries. Among the philosophers who flourished in the eastern portion of the Islamic territory during the eleventh century, the Persian Ibn Sina (whom the Christians called “Avicenna” in Latin) was the most subtle and sophisticated. Although his view of the world relied heavily on the familiar neoplatonic emanations, Ibn Sina had learned of the Aristotelean system in his medical studies and from the work of al-Farabi, and he tried to combine elements from both sources in a comprehensive account of reality. All human awareness begins with knowledge of the self, which can be acquired entirely without the aid of the senses, through the active power of the “agent intellect” which is the human mind. But since the essential quality of human thinking cannot be realized without some prior existing cause, contemplation of our own reality as thinking things leads naturally to awareness of the existence of something else. In addition to the merely contingent beings of the created order, then, there must also be a necessary being, god, who is prior to all the rest. God, then, is the central reality from which all else must be derived. Respecting the power of god and emphasizing the regularity of the natural order, Ibn Sina maintained that all of the genuinely causal connections that link the central core, through its successive emanations, to its final outcomes in the material world, must themselves be perfectly necessary. Since the cosmos is a single unified whole, everything that happens does so as it must; what appear to us to be the local causes of particular events are nothing more than the occasions for our awareness of what happens. Its ultimate origin is always god. A century later, in the lively Andalusian community at the western extreme of Arab influence, another great Islamic philosopher placed even greater emphasis on the work of Aristotle. Ibn Rushd (“Averroës” in Latin) wrote so many analyses and explanations of Aristotelean works that he became known throughout Europe simply as “The Commentator.” It was almost exclusively as a result of his labors in translating and explicating the Aristotelean corpus that the Greek philosopher came to exert a lasting influence on the Western culture. Devoted to the teachings of Aristotle, Ibn Rushd often disagreed explicitly with his Islamic predecessors. 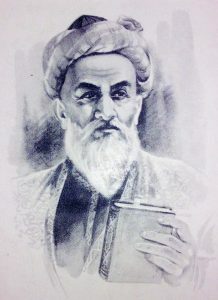 Writing his Tahafut al-Tahafut against Ghazali, he argued that application of reason to philosophical problems can lead to genuine knowledge of the truth independently of revelation. Against Ibn Sina and the neoplatonic emanation theory, he maintained that efficient causation is a genuine feature of relationships among created things, although the first mover remains the ultimate source of all motion. Following Aristotle’s view of the individual human being as a hylomorphic composite of soul and matter, Ibn Rushd could only promise immortality through absorption into the greater whole of the universal intellect. Medieval Judaism provided another significant stream of philosophical speculation. Social, personal, and intellectual freedom for Jews was greater in the Islamic world of that era than among the anti-Semitic Christians of Europe, who often simply regarded Jewish thinkers as Arabs. Though born in Egypt, Gaon Saadiah, for example, spent his most active years studying the Talmud in Baghdad. Most medieval Jewish philosophers dealt with the familiar difficulty of trying to synthesize philosophy with religion, but their neoplatonism was often infused with a greater degree of emphasis on the mystical apprehension of reality. The greater breadth of learning achieved by Jewish scholars often resulted in the combination of particular elements derived from diverse philosophical sources. Although Ibn Gabirol accepted Plotinus’s view of god as the center from which all created reality emanates, for example, he also defended ahylomorphic account of ordinary objects and proposed a physiological explanation for human conduct and morality. Ibn Daud made an even more explicit use of Aristotelean metaphysics. The most widely respected of the medieval Jewish philosophers was Moses Maimonides, whose patient codification of centuries of commentary on Jewish law in the Mishnah Torah earned him a place of honor among Jews in the saying, “From Moses until Moses, there was no one like Moses.” From the neoplatonic philosophical tradition, he took the central vision of god as the sole source of all genuine knowledge, of which human reason can only hope to gain a remote glimpse. Thus, in the Moreh Nevukhim (Guide to the Perplexed) (1190) Maimonides suggested that philosophical reasoning about ultimate matters is neither necessary nor even helpful for most ordinary people, who would be better advised to rely upon faith. For members of the educated elite, who are more capable of understanding abstract philosophical reasoning, however, there may be at least some hope of success. Balancing the philosophical and prophetic traditions, Maimonides himself provided Aristotelean arguments for the existence of god, Biblical evidence for the creation of the universe, and a carefully-crafted synthesis of reasons for the possibility of a divinely-produced immortality for embodied human beings. This entry was posted in Medieval, Middle Ages, Philosophy. Bookmark the permalink.